Death*: He died on 27 July 1936 at Chicago, Cook County, Illinois, USA, at age 65. His death certificate states he died by asphyxiation from drowning after jumping into the Chicago river. His body was found at the north branch of the Chicago River at Western Avenue. An inquest was held and it was determined it was a suicide while temporarily insane. 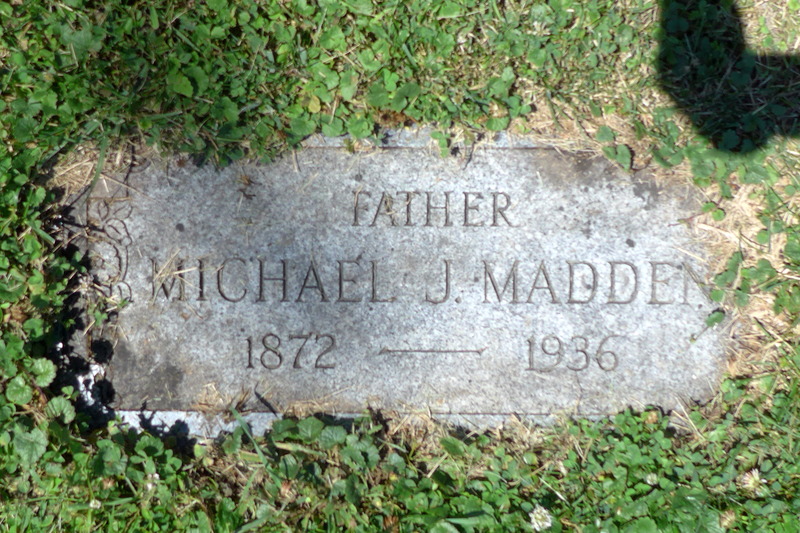 [S2506] Michael J. Madden Cemetery marker, All Saints Cemetery, Des Plaines, Illinois. Marriage*: She married Unknown Durkan. Biography*: Four articles appear in the Chicago Tribune related to the murder of Patrick Madden. November 20, 1932 - "Gunman Kills a Policeman; Another Shot"
November 21, 1932 - "Killer is Identified"
December 21, 1932 - "22 Police Trap Alleged Killer of a Comrade"
June 15, 1933 - "Gets 99 Years for the Murder of Policeman"
"GUNMAN KILLS A POLICEMAN; ANOTHER SHOT"
One policeman was shot and killed an another was wounded in the abdomen by a red haired gunman at Walton and Hot streets early this morning. The slayer escaped in a hail of police bullets fired by four of his victims' comrades. The policeman slain was Patrick Madden of the North Racine avenue station. Roman Orzechowski, also of the Racine avenue station, was the policeman wounded. He was taken to St. mary's hospital, where it was said there was slight hope for his recovery. Madden, 54 years old, a veteran of the force, liven at 2903 Belmont avenue. The double shooting was unexpected, for the gunman had submitted to arrest a few moments before. Madden lost his life and Orzechowski may die through failure to search to prisoner. A few minutes before the gun play the police had received a complaint that some one was shooting promiscuously near 1451 Walton street. This complaint was flashed over the radio. Policemen Madden and his fellow wagon man reached the scene first. They found a home party in progress at the Walton street address. There was no disturbance there, but the police were told a man who had been firing on the street was hiding under a porch nearby. Madden found him there. Just then Policeman Vernon Johnson and Stanley Pabish drove up. "No shooting," announced Madden, holding his prisoner. "Go over to the box and notify the station." Johnson and Pabish turned around, satisfied the prisoner was an ordinary Saturday night drunk. They met Policeman Orzechowski and Otto Buck driving up in another police car and relayed the message that there was no shooting. Orzechowski got out of his car and walked toward Madden. As he did so, the prisoner wrested himself from Madden's grip. Madden, a husky fellow, seized him again, and in the momentary struggle, during which Orzechowski ran forward to help Madden, the suspect drew a gun. He fired with the muzzle close to Madden's body and the bullet pierced the policeman's heart. Orzechowski drew his gu and was about to fire when the gunman, less than 10 feet away, felled him with a bullet in the abdomen. Policeman Buck, Johns, Pabish and Magnuson, hearing the firing, drew their revolvers and went after the gunman. He fired back at them as they sent more than a dozen bullets after him and disappeared down an alley. From a coat believed to have been left behind by the slayer, police obtained the name of Frank Blick, 24 years old, 638 North Sawyer avenue, and squads began a search for him. [S350] Killasser RC reg., Bapts., vol. 2, p. 274. [S1757] The Officer Down Memorial page, Inc., online www.odmp.org, Patrolman Patrick Madden, accessed July 23, 2009. Marriage*: He married Catherine Lynsk. [S357] Foxford Civil reg. Marriages, vol. 9, p. 35. Death*: She died in 1969 at Chicago, Cook, Illinois, USA. Sally [Nan] Madden, dear sister of Mrs. Paul [Cecille] Heidkamp, and the late Thomas P. Madden; fond aunt of Paul, Thomas, William, Judy, Sally, Mrs. Daniel McCarthy, Jane, and Mike Heldkamp. At Coleman's, 4611 N. Lincoln. Funeral Friday, 9:30 a.m., Our Lady of Lourdes church. Interment All Saints. In lieu of flowers, contributions to Sisters of Charity, B. V. M., will be appreciated. SU 4-8888. [S1676] Find A Grave, online http://findagrave.com, Sarah Sally "Nan" Madden, memorial ID 196981366, created by grave digger, created February 20 2019. Accessed March 3, 2019. [S343] Death notice reported by the Mayo North Family Heritage Center in report December, 1998. It reads: Thomas Madden, a 55 year old married man was found dead in Crohan Lake on Monday morning the 1st of August 1898. His death was registered by Edmond C. Kelly, coroner for Co. Mayo. [S344] Foxford Civil reg. Deaths, vol. 10, p. 61.